Most of the immigrants rushing to California from around the world had no choice but to come by sea. The journey was long, hard and very dangerous. After preparing for a four to eight month journey, and parting from family and friends, thousands of argonauts set sail. The promises of ships' advertisements were quickly disproved by the realities of life onboard, and gold fever was soon replaced with sea sickness. The "forty-niners" recorded the challenges, hardships, struggles, and dangers they encountered in diaries and letters: terrible storms, inadequate food and water, rampant diseases, overcrowding, and shipwrecks. 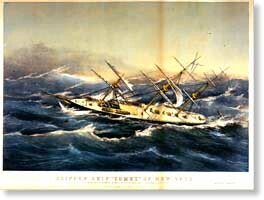 Between April 1849 and January 1850, nearly 40,000 argonauts arrived in San Francisco by sea. There they discovered that they were still 150 miles from the closest gold fields, and that most of the easy placer gold had already been picked up. But they had survived, and opportunities were plenty in California.